Always dreamed of going back in time and watching Edison create the lightbulb? Well good luck with that, but you can witness the newest batch of game-changing inventions at Red Bull Creation. 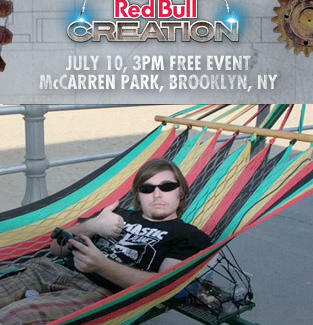 Held at Brooklyn's McCarren Park on Sun, July 10th, this epic, free-to-watch showdown pits 16 Red Bull-selected teams of engineers, hobbyists, and general tinkerers against each other as they each show off what they think's the greatest invention since the bread bowl. Everything you'll witness was imagined, designed, and built over a period of 72 hours at a top-secret NYC space called the "Red Bull Creation Laboratory". All will be evaluated by a wildly eclectic team of judges, from an NYU prof, to a robot-builder, to the co-founder of Burning Man, so should any invention go terribly awry, at least someone will be ready when the world devolves into a maelstrom of naked chaos. Fabricate a new browser tab and head to RedBullUSA.com/Creation to prep yourself for the event and see profiles of each team, who'd all make Edison extremely proud baffled.